Is your birthstone Amethyst for being a February baby? Or maybe a loved one's birthday is coming up in February and you just cannot think of what you could possibly get them? These 4mm heart shaped earrings are the perfect gifts! 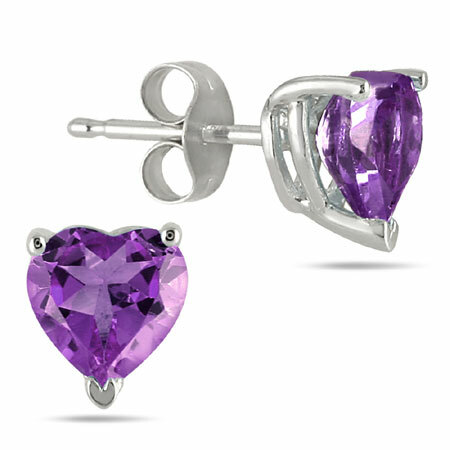 The heart studs are made out of natural Amethyst, which is a stunning purple color that can go good with almost any outfit you could put together. The 4mm Amethyst stud is put together with 14K White Gold plates, holding the piece together securely in a fashionable manner. The white gold is a perfect fit for any outfit, whereas gold you have to coordinate correctly. The earring backs are push backs, which ensure a safe and tight fit, without the possibility of pinching yourself like you could do with a traditional earring piece. Do not wait, order these beauties today! You or your loved one will absolutely adore them, without the slightest doubt. We guarantee our 4mm Heart-Shaped Amethyst Stud Earrings, 14K White Gold to be high quality, authentic jewelry, as described above.